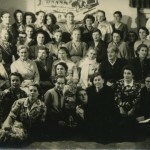 The Polish Research Institute Archive is a unique collection of source material from the survivors of Ravensbrück and other Nazi concentration camps. With the help of your generous donations we have made parts of the archive available online. The interviews, transport lists, lists of arrivers to Sweden, photographs, drawings, poetry notebooks, personal notebooks, teaching materials, work journals, and Helena Dziedzicka´s notes from the trials have all been digitized in their entirety. We thank our donors for your very generous support. Towards the end of World War II, approximately 20,000 Nazi concentration camp survivors were evacuated to Sweden. The rescue operations were organized by the Red Cross and United Nations Relief and Rehabilitation Administration. 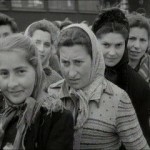 With the intent of documenting the war crimes and the experiences of the victims, a working group called “The Polish Research Institute in Lund” was founded to conduct in-depth interviews with the former prisoners and collect material that the survivors had brought with them from the camps. The initiator of the documentation project was Zygmunt Lakocinski (1905-1987), lecturer in Polish at Lund University, who worked as an interpreter at the arrival of the survivors. The material was intended to be used as evidence in future trials and as source material for historical research. Financed by the Swedish government, Lakocinski assembled a team of co-workers – themselves former prisoners of concentration camps – who in 1945 and 1946 conducted more than 500 interviews. 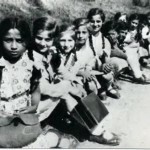 A majority of the interviewees were Catholic women who had been imprisoned at the Ravensbrück concentration camp, a camp for women and children located 90 km north of Berlin. 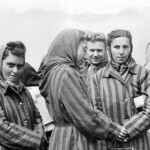 Many survivors had been transferred from camp to camp during the war, and the interviews also detail events and experiences from a number of other concentration camps, including Auschwitz, Bergen-Belsen, Dachau, Majdanek, Neuengamme and Sachsenhausen. Exactly how the interviewees were chosen is not fully known, but more than half of the interviewees were under 35 years of age, 71% were women, 85% were Roman Catholics, 12% Jewish and 3% of other or unknown religious affiliation. The historian Sture Bolin aided the Polish Research Institute in developing a method that ensured that the interviews would be reliable as source material. In practice, this meant that the interviews should take place as soon as possible after the liberation, and that the testimonies should be a combination of outlines and verbatim witness accounts, which could then be substantiated by other witnesses. It was also deemed important that the collection of information was as objective and impartial as possible, and that the interviewer distinguished between facts and the interviewee’s emotions. To achieve this, it was essential to note names, places and expressions mentioned by the interviewee and to stick to the framework of chronology. To keep the interviews structured, they were conducted by using a set of general questions which allowed the interviewees to recount their personal experiences in an ordered way. After the interview, a transcript of the witness testimony was signed by both the interviewee and the interviewer. Though personal belongings were forbidden in the concentration camps, many survivors had managed to keep small objects hidden and bring them with them to Sweden. Among the personal belongings donated to the working group were letters, photographs, personal notebooks, drawings, food recipes, prayer books, teaching materials, as well as work journals used at camps (so-called Blockbücher). In addition to this material, which is now part of the archive, the working group also collected a large number of physical artefacts, such as crucifixes, dolls and pieces of cloth, that are now kept at Kulturen in Lund. The Polish Research Institute also compiled information that could be used as reference resources. These included lists of concentration camps, SS personnel, Nazi prisons, persons deceased and executed in the camps, vocabularies listing terms used at the camps, as well as Swedish refugee camps and hospitals where the survivors were placed. The institute also copied transport lists (probably to and from the Ravensbrück concentration camp) and the Red Cross’ and UNRRA’s lists of Polish citizens who were evacuated to Sweden. The archive also contains personal notes by Helena Dziedzicka, a former prisoner at Ravensbrück and member of the working group, taken when she testified at the so-called Hamburg Ravensbrück trials in 1946-1947. For a complete overview of the archive please see this Lund University Library page. The witness testimonies, all written in Polish, are in the process of being translated into English, and new translations are added continually.